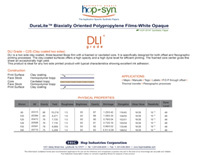 12"x 18" up to 60"x 80"
Hop-Syn® DL grade is a clay coated biaxially oriented polypropylene synthetic paper that is light enough to float on water, but still strong enough to withstand water, grease, chemicals, sunlight and tearing. DL’s smooth clay coated surface is produced with a high brightness, high opacity and a high dyne level that yields a high color resolution with a superb print definition. Our low-density C2S synthetic paper has a caveated center to make our DL grade light in weight and based on its construction, it is strong enough to meet the most tear resistant applications.